I would like to mention one of the recent trend topics in this article. Freelancers. 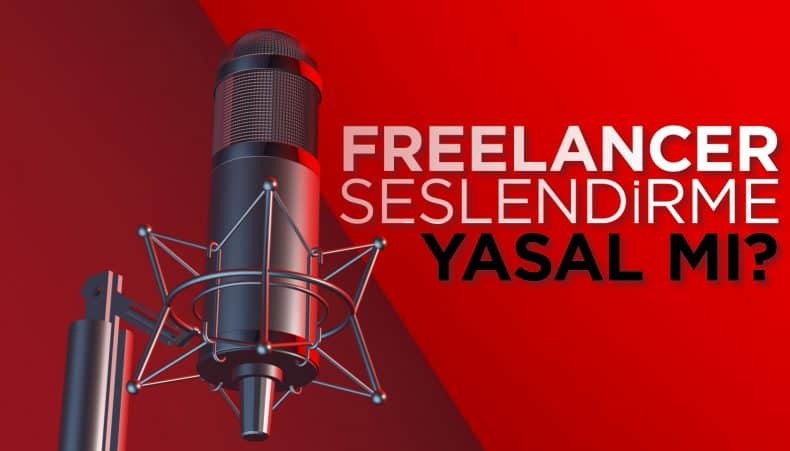 The term ‘freelancer’, which refers to “independent author” when translated to Turkish, is actually used as “free employee”. After 2015 freelancers has become widespread in Turkey. IS IT LEGAL TO WORK WITH A FREELANCER VOICE-OVER TALENT? Or is it good to work as a freelancer? Is it bad? Is it legal? Is it not legal? We asked these questions to the business experts. As is known to all, each country has its own trade rules. If you are working in the sector within these rules and it is now a serious job this means you have a tax liability. Especially if you are a freelancer and receive the payment over your account number, you need to issue an invoice for the payment you receive. And it doesn’t mean that since no one has check your account and haven’t asked anything about it until now that you are good to go. It is possible to work as a freelancer with the condition of obeying the commercial rules. If you are not paying any taxes and you are not working with not only one agency but a few, this concerns your agency. The agency that you are working for organizes the note of expenses. If you are communicating directly with the customer through some platforms other than the agency as a freelancer then you must pay your taxes. This may not be a problem today, but you may have some issues in the future. Most of the people in the voice-over and dubbing business have chosen to do this legally by working with an agency and paying their taxes under the name of the agency. We are warning those who prefer to use freelancers illegally as part of other illegal platforms. It is a very important issue that we work legally with the awareness of citizenship without forgetting that such illegal unrecorded work harms the country’s economy. Another problem for the company or business owner is that they count on these freelancer sites. Doesn’t the fact that they are not billing anyone prove that these sites are illegal? We invite you to be more sensitive about this matter. Unfortunately, voice-over is not the only thing that freelancers do. Freelancers can be seen as web designers, software designers, designers and graphic designers which all of them can be done easily from almost anywhere. We seem to hear some people say “Shouldn’t we make some money without paying taxes, must we really pay?” The answer to this question is ‘yes’. If you are a freelancer and you are constantly receiving payments to your account, it is time to pay your taxes. However, if you do this job a few times a year and only work with agencies then it’s the agency’s responsibility. The agency needs to arrange a note of expenses for it. Whatever it is you do as a freelancer, the right thing to do is to work with voice-over and dubbing agencies instead of working on an illegal platform. Freelancers are not only in Turkey, it’s a worldwide trend. Many people earn their living from freelance work. In order for these works not to threaten the economy of the country, countries need to promote individual institutionalization and should make everyone pay their taxes. Freelancers in Turkey should choose the right thing and work with agencies, while also paying their taxes. Another option is to resign as a freelancer and become able to invoice by establishing their own companies. Turkey should leave all the instruments and platforms that will lead to unfair competition, should not resort to anything illegal.